We’ve been pointed to a series of BMW videos from late last year which might be of interest to both certified collision repairers and unaffiliated shops alike. Our favorite was a fun November video by BMW Canada which might help illustrate to customers and insurance adjusters why OEM procedures demand certain collision-damaged components be replaced, rather than repaired. “Let’s simulate the difference between a Non-Certified Repair Procedure and a Certified Repair Procedure carried out by BMW Certified Collision Repair Centres,” a caption states. 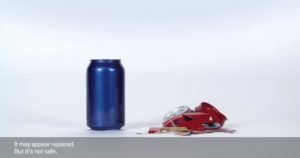 This simulation involves a pair of damaged aluminum cans. For one, what is presumably a certified can repairer sections out a damaged part of the container and glues a pristine piece in its place. “Only Original Parts are used,” a caption states. Another can with similar damage is beaten out and slathered with body filler, achieving a similarly smooth surface. Both cans are refinished. A man then stands on both and demonstrates what can happen when you repair a damaged part in violation of OEM procedures. The film conveys the moral effectively, even if it lacks the panache and apples-to-apples nature of Honda smashing two actual vehicles (MDXs) to prove the same point. BMW Canada produced another nice plug for its certified shops in November, showing how one could restore a BMW M3 used in an action movie if they wanted. If you’re a BMW certified shop, show the video to friends and family and tell them that you fix sedans chased by motorcycles all the time. It also in November made a pitch for using only OEM collision parts. “To maintain your vehicle’s original showroom condition, make sure you only use original BMW parts and original BMW repair procedures, so that your BMW stays a true BMW,” the narrator states. And finally, while not specifically tied to collision repair, an October BMW USA film might still speak to shops. It features a South Carolina driver protected during a crash by BMW engineering and shows the kind of accident research the OEM conducts. These two elements should help reinforce why a collision repairer must hold himself or herself to the standard of preserving that crashworthiness and that an OEM isn’t just designing repair procedures and structural components arbitrarily.